On Saturday, August 18 we hosted 28 members and guests for National Day of Civic Hacking to explore using data, technology and relationships to understand and improve our community. The day featured two parallel activities: one on mapping relationships in the community and one on getting and using data to understand issues and advocate for change. Downstairs, Melanie Mazanec led the effort to create a map of the networks of organizations and people working on issues in the community. 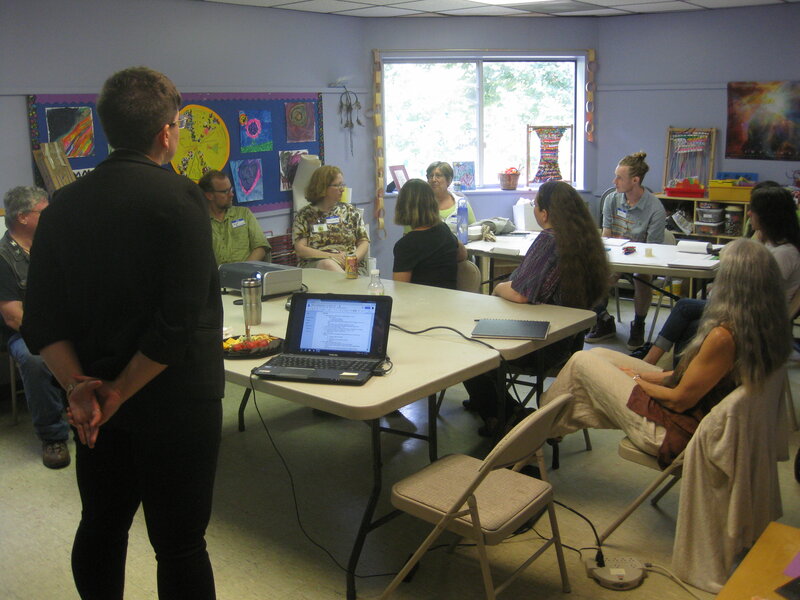 The session was well-attended by people with years of experience in the Asheville social service scene, making for lively, informed discussion. In the course of their work, the group discovered that at least four other groups are working on similar projects. As next steps, the group will create a demonstration prototype of the network visualization and contact other groups to see if they are interested in collaborating. Email info@codeforasheville.org if you’d like to help. Meanwhile, upstairs Jesse Michel and Patrick Conant kicked off the data track with an introduction to open data and public records. Their talk, Public Data Analysis for Non-Analysts: How to think and talk like a public data nerd, touched on questions like: What is Open Data? What type of data is public? What tools are available to make records request or access data? What makes a successful Public Records Request? How can you use data to impact policy change in the community? Attendees participated in several activities. One involved picking where to stand between opposite sides of the room to indicate how difficult folks feel it is to make a public records request, how transparent the City of Asheville is, and whether folks feel data is an important tool for policy advocacy. The results and discussion were both quite interesting. You can watch the full session here. The second half of the data track was led by George Collier, supported by Tyler Bradley. 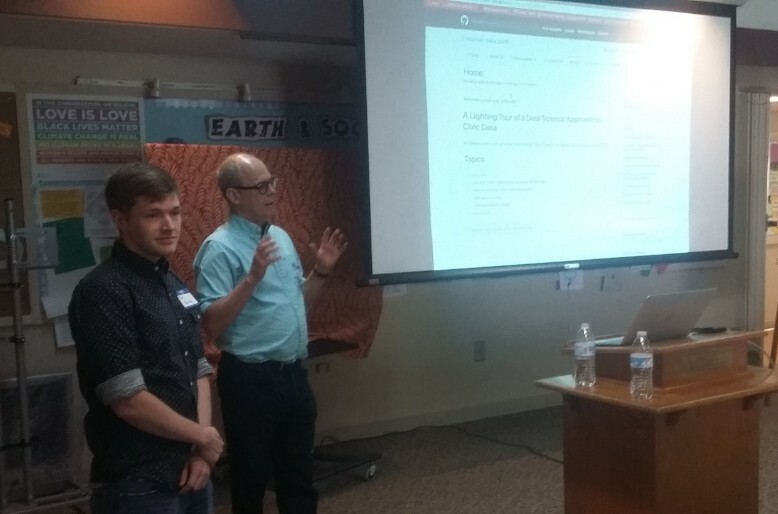 After describing just what data science is and what the steps of a data science project are, George and Tyler walked participants through a simple example using American Community Survey data for Buncombe county at the level of census block groups. They demonstrated how to load the data into analysis tools and began looking for patterns in the data. At the end Tyler generated the demonstration choropleth map below showing how unemployment varied by block group in 2015. There was good conversation about what roles data can and can’t play in discussions about social equity. Participants left feeling like they had a better understanding of how data science works, and several expressed a desire to learn to work with the data and use the tools George and Tyler demonstrated. You can find the code from this session here and the presentation here. Attendees of Jesse’s and Patrick’s session were asked to fill out brief survey questions about the workshop and our local government. Whether you were there or watched the video, please use this Google form to let us know what you thought of the presentation! Email info@codeforasheville.org if you’re interested in participating in the community mapping project or learning more about data. HUGE thank you to Jay Hill for filming the data session and preparing the video!